It isn’t getting easier to stay atop the waves of modern technology: a real IT Pro needs to have certain tools at hand, and he shouldn’t stop learning. Whereas technology vendors may offer efficient “all-in-one” products, there may be a time when you have to come up with an ad-hoc solution and fix a problem that’s just occurred. This is when a sysadmin can turn to Windows PowerShell and use a script to troubleshoot much of what he considers crucial. 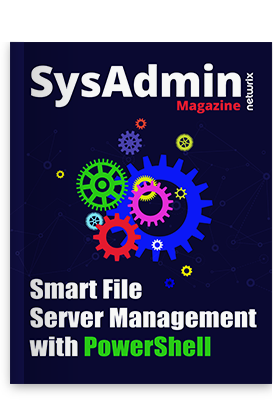 The September issue of “SysAdmin Magazine” is a special edition completely focused on the puzzles you can solve with PowerShell scripting. This is a great chance to find out what PowerShell is and where to use it, and – more importantly – to get in-depth technical advice from industry luminaries: PowerShell MVP Adam Bertram and Windows security expert Russell Smith. Try to apply their scripts and see it for yourself: your job is going to become a tad easier. Hold your breath and take a deep dive into the sea of possibilities which PowerShell gives you – with “SysAdmin Magazine” as a helpful asset!